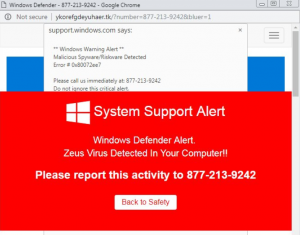 This article has been created in order to explain to you what is the System Support Alert scam and how you can remove the scamming message and the potentially unwanted program that is causing it on your PC. The System Support Alert is the type of scamming message which has been designed in order to trick users in to calling the tech support number 877-213-9242. 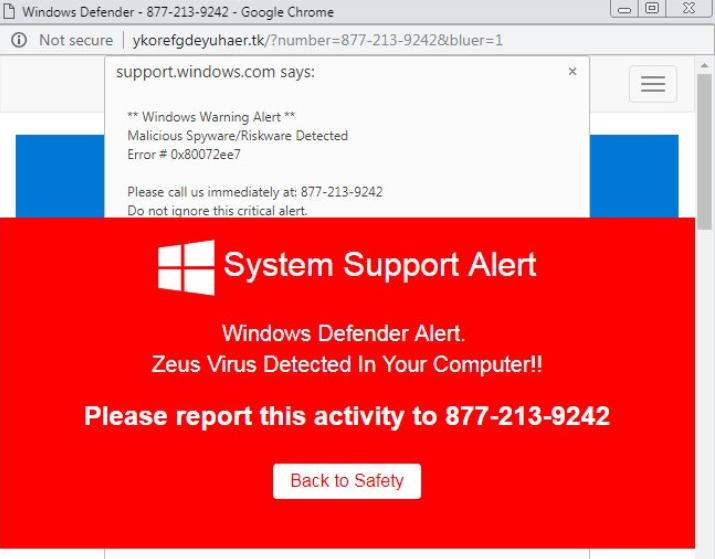 Calling the number is highly inadvisable, since the scammers may employ scare ware tactics with the main goal to get you to grant them remote access to your computer and ask you to pay a lot of money to remove what they claim is the Zeus Virus. In the events that you have encountered the System Support Alert messages, we would suggest that you immediately take actions towards removing the program causing this tech support scam page to appear by reading the following article. Symptoms You may start seeing various types of online pop-ups and other types of unwanted content to begin appearing. User Experience Join Our Forum to Discuss System Support Alert. For the System Support Alert to be spread on the computers of users, there may be several methods via which this may have happened. One of those methods is if you have visited a website which has a low reputation. Usually low-rep sites often cause web browser redirections and other types of unwanted browser redirects the outcome of which may be to have your web browser locked by this scamming pop-up. Another reason for receiving the System Support Alert redirect could be if you have a PUP (potentially unwanted program) that is installed on your computer. Usually those unwnated programs tend to find themselves onto users’ computers by slithering into the installers of third-party freeware aps downloaded from software providing websites. These installers may contain the PUP that is causing the System Support Alert pop-ups on the computers of users. Most users tend to miss it’s installation prompt, because the install step is often concealed In the “Custom” or “Advanced” installation options on the user PC. The message claims that Spyware has been detected on the victim PC, and this may not even be the case as no real antivirus program or support software would ask a victim to call a tech support number. And when we checked the number itself (877-213-9242), we have quickly come to the conclusion that multiple different instances of the number have started to pop-up on the radar of victims. In December 2018 we have been alerted of a new variant of the System Support Alert scam. The pop-ups show a different message which impersonates Microsoft and manipulates the users into thinking that they have been infected with a virus threat. A fake tech support number is quoted. The classic scenario is followed: the victim users will think that a genuine threat has been detected on their systems. The pop-up is similar to actions orchestrated by anti-virus software and operating system services which uses it as a notifications method. The number quoted will connect the victims to a fake tech support center from where the criminals will direct the users into paying the a large fee in order to “restore” their computers. In reality the serious security issue is the presentation of the pop-up dialog, this might signal that the users have visited a malicious site or portal or that their system have been infected with another threat — browser hijackers for example. User Tracking — The pop-ups and associated scam page can deploy tracking cookies that will harvest detailed information about the users and their machines. Further Redirects — Upon accessing the site or when interacting with certain elements the users can be redirected to other scams or hacker sites. This can lead to virus infections and other dangerous scenarios. If you want to remove the System Support Alert tech support scam from your computer, we strongly suggest that you follow the removal instructions posted underneath this article. They have been created with the main idea In mind to help you delete this virus either manually or automatically. Be advised that according to experts the best way to try and remove the software that is causing the System Support Alert scamming pop-ups is to use an advanced anti-malware software. Such program is created with the idea in mind to fully scan your computer and try to eliminate any traces of unwanted programs while protecting your computer against future infections as well. Threats such as System Support Alert may be persistent. They tend to re-appear if not fully deleted. A malware removal tool like Combo Cleaner will help you to remove malicious programs, saving you the time and the struggle of tracking down numerous malicious files. Threats such as System Support Alert may be persistent on your system. They tend to re-appear if not fully deleted. A malware removal tool like SpyHunter will help you to remove malicious programs, saving you the time and the struggle of tracking down numerous malicious files. Note! Your computer system may be affected by System Support Alert and other threats. SpyHunter is a powerful malware removal tool designed to help users with in-depth system security analysis, detection and removal of threats such as System Support Alert. 1. Install SpyHunter to scan for System Support Alert and remove them. 2. Scan with SpyHunter, Detect and Remove System Support Alert. Ransomware infections and System Support Alert aim to encrypt your files using an encryption algorithm which may be very difficult to decrypt. This is why we have suggested several alternative methods that may help you go around direct decryption and try to restore your files. Bear in mind that these methods may not be 100% effective but may also help you a little or a lot in different situations. Note! Your computer system may be affected by System Support Alert or other threats. Remove System Support Alert by cleaning your Browser and Registry. Fix registry entries created by System Support Alert on your PC. Combo Cleaner is a powerful malware removal tool designed to help users with in-depth system security analysis, detection and removal of threats such as System Support Alert. Step 5: In the Applications menu, look for any suspicious app or an app with a name, similar or identical to System Support Alert. If you find it, right-click on the app and select “Move to Trash”. Step 6: Select Accounts, after which click on the Login Items preference. Your Mac will then show you a list of items that start automatically when you log in. Look for any suspicious apps identical or similar to System Support Alert. Check the app you want to stop from running automatically and then select on the Minus (“–“) icon to hide it. Remove System Support Alert – related extensions from your Mac’s browsers. A pop-up window will appear asking for confirmation to uninstall the extension. Select ‘Uninstall’ again, and the System Support Alert will be removed. When you are facing problems on your Mac as a result of unwanted scripts and programs such as System Support Alert, the recommended way of eliminating the threat is by using an anti-malware program. Combo Cleaner offers advanced security features along with other modules that will improve your Mac’s security and protect it in the future. Hey !, I found this information for you: "System Support Alert (Windows Defender) Scam – How to Remove It". Here is the website link: https://sensorstechforum.com/system-support-alert-windows-defender-scam-remove/. Thank you.